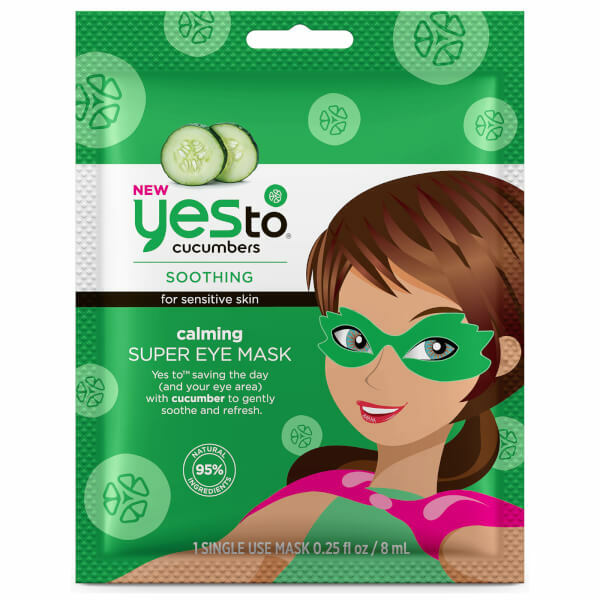 Rejuvenate tired eyes with Yes To Cucumbers Soothing Super Eye Mask; a targeted treatment to comfort, hydrate and refresh in just ten minutes. Utilising Cucumber Extract, the fun shaped, single use mask replenishes and refreshes the delicate eye area, whilst cooling and soothing to restore long-lasting comfort. Crafted from soft cotton, making it ideal for sensitive skin types. Cleanse eye area then gently unfold mask and apply around eye area. Adjust and smooth mask around eye area. Sit back and relax for 10 minutes. Remove eye mask.